I used to use an oily rag to wrap up my favourite planes in. But no longer! Of course I will only know how well these products work in a year's time after my tools have been through the next winter, but anything which reduces rust is worth knowing about! 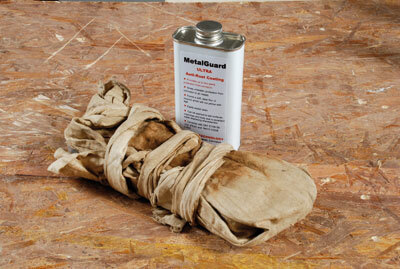 Metalguard Ultra is a silicone-free liquid that forms a 2-micron film on the metal that it is applied to and it is designed to protect surfaces for up to two years. It is certainly easy to apply and probably this should be done annually when giving the workshop the pre-winter tidy up. I understand that turners use it for protecting infrequently used lathe accessories and I'm sure that cabinet makers have some rarely used metal kit that is quiety rusting in a dark corner. Bearing in mind the adage 'rust never sleeps', a tin of this should prove very useful. If you want to remove the coating simply wipe it off with white spirit. Wiping every tool in the box with Metalguard would be a bit of a tedious job so Shield Technology have also produced little plastic containers 35mm diameter by 12mm deep of ToolGuard VCI. They have an adhesive pad on the underside and can be placed in a tray or toolbox. Leave the lid off and they emit corrosion-inhibiting vapour. They last for a year and each tin will protect a volume of 2cu ft. ToolGuard VCIs do not leave your tools sticky in any way and therefore have no danger of marking your projects. 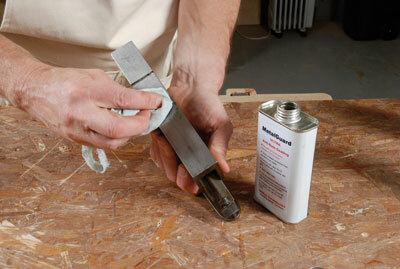 The final product in the Shield Technology armoury is an additive for honing fluids. 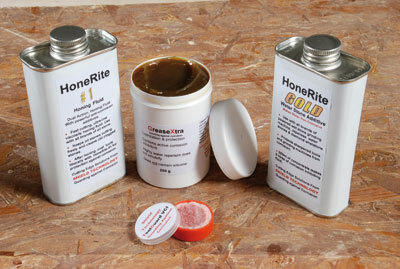 HoneRite Gold can be added to water to make the water used in tool sharpening processes non-corrosive. Again, it will need a long-term test which I will be conducting over the next few months but the literature supplied says that it can be used on slow-running wet wheels, Japanese water stones and on diamond honing systems. To my mind the latter is the most interesting as I do not have a rust problem related to grinders or Japanese stones; however, the question of honing lubricants causing deformation of diamond stones is very relevant to all who use them. I am sorry that at this current time I cannot tell you how well these products work, but I will in the future! However, now that you know about them you can certainly make your own judgment. "Now that you know about them you can certainly make your own judgment"